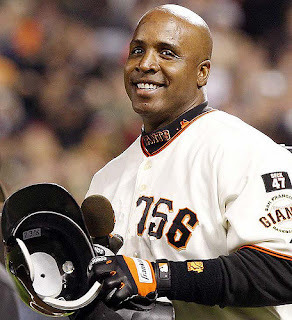 I place Barry Bonds (born 1964) in Generation X...also known as the Steroid Generation because many (most, according to Jose Canseco) of its members used (or were accused of using) performance-enhancing drugs. This generation includes all players born between 1962 and 1980 - 3,600 players with MLB experience. You could call these 3,600 players the peers or contemporaries of Barry Bonds. Out of those 3,600 players, Bonds ranks 1st in runs scored, 1st in homeruns, 1st in walks, 1st in on-base percentage, 1st in slugging %, 1st in OPS, and 1st in OPS+. He's his generation's all-time leader in runs created (by over 600), even though he's only 8th in outs. He leads his peers in total bases, extra-base hits, times on base, Wins Above Average, and Wins Above Replacement. He's also 2nd in runs batted in, 3rd in stolen bases (but 8th in caught stealing), 4th in doubles, and 7th in hits. Let's compare Bonds' accomplishments to those of one of his more-likable peers: Ken Griffey Jr., who was just inducted into the Hall of Fame with the highest-ever percentage of votes from the BBWAA. Among Gen-Xers, Griffey ranks 3rd in homeruns, 3rd in RBI, 4th in total bases, 4th (tied) in XBH, 7th in runs created, 7th in outs, 8th in runs scored, and 9th in times on base. He's not in the top 10 in hits, OBP, slugging, or stolen bases. He ranks 8th in WAA and 6th in WAR, so he's arguably not even the best position player in his generation who's untainted by steroid allegations. For sheer performance, Generation X might have been the best generation of baseball players ever, and Barry Bonds was the best player of that generation. Yeah, he was almost certainly using PEDs, and Griffey almost certainly wasn't. But, as I said, Bonds was far from the only player using; he belonged to a PED-enhanced generation. But between the surely PED-enhanced (Bonds, McGwire, A-Rod) and the surely natural (Griffey), there's the vast majority of this generation's players, and they're stuck in a murky limbo of allegations and uncertainty about whether or not they used and to what extent using improved their performance. The only thing we know for sure is the record book. And we know two things about Bonds: he was a first-ballot Hall of Famer BEFORE he (allegedly) started using (in 1999) (400 homers, 400 steals, .400 OBP, 8 Gold Gloves), and once he started using, for about five years he was the greatest (and most feared) hitter the game has ever seen.